(This is the first of four installments on this subject). With the mild 2006 hurricane season barely fading from memory, we now have a professor from Colorado telling us that next year’s hurricane season will be worse than most. We moved to South Florida in 2004, just in time for two of the worst hurricane swarms in US history. Here, in 2005, Hurricane Katrina loomed in from the Atlantic and veered southward at the last moment, sparing us major damage. Of course, Katrina went on to devastate New Orleans. Then, as Katrina approached the upper Gulf Coast, we recalled our experience with Hurricane Camille– the horror we felt on Sunday evening, August 17, 1969, a family of six crouching in our home, below sea level on the West Bank of New Orleans, hearing the windows rattle and tree limbs shatter. A resident in General Preventive Medicine residency under a USPHS/Tulane University program, I was just starting a rural public health rotation with the Louisiana State Health Department. That morning I had finished a 24 hour shift as Officer of the Day at the New Orleans Public Health Service Hospital, and was able to return home Sunday at noon, aware that we were facing the threat of a mighty storm. A portable radio was our only contact with the outside world. We stayed awake all night listening to reports of the storm’s position and the status of the storm drainage pumps. We felt relief that the storm was quite compact and that the eye had passed some 35 miles to our east, but we were alarmed to hear that major flooding had occurred within a couple of miles of our home, and that thousands had lost their homes and were crowded into nearby hurricane shelters. Camille, with an unusually compact eye of 5 miles diameter, was then the most intense hurricane ever to strike the United States mainland. Winds exceeding 200 miles per hour and an extremely low central pressure combined to generate the highest tides ever recorded on the Gulf Coast. A wall of water, up to 30 feet high, surged through the populous Bay St. Louis - Pass Christian Area of Mississippi. Houses that had withstood many previous storms were reduced to piles of rubble by the ravages of wind and water. In many cases, all that remained of homes and businesses were the concrete foundation slabs. 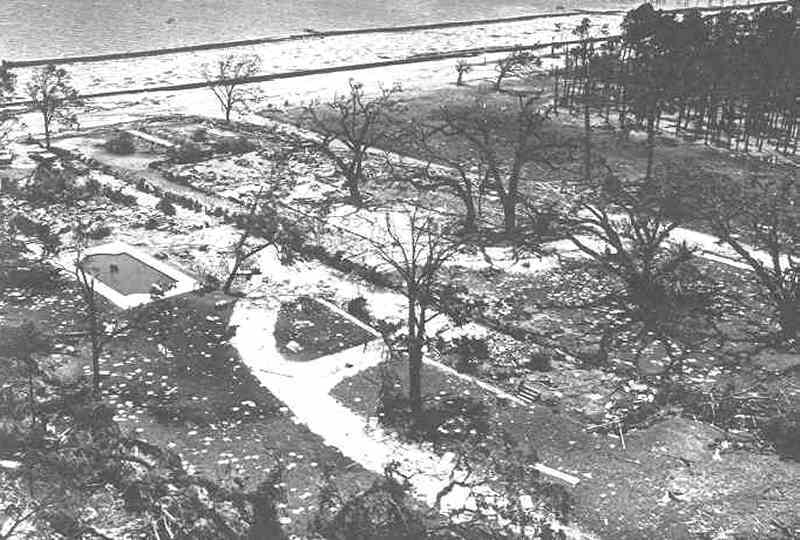 This was the unusual aspect of Hurricane Camille — widespread destruction of homes caused large numbers of refugees to remain homeless for long periods of time. Of the 284 known deaths, only 5 occurred in Louisiana, 3 of these in Plaquemines Parish (County). This is the Parish that occupies both banks of the final 80 miles of the Mississippi River, just below New Orleans. Early evacuation of nearly all the residents of the southernmost low-lying areas undoubtedly averted hundreds of casualties. On the West Bank of the river south of Empire, where 11,000 people lived, destruction was virtually total. Here alone, over 3000 homes were either completely destroyed or sustained major damage. Flood waters, up to 17 feet deep, persisted for nearly a week after the storm. In Buras, two high schools, later to be used as shelters, were flooded up to the second floor level. The next morning, responding to calls for medical volunteers, I contacted my program director to request annual leave, and appeared at Belle Chasse High School shelter to offer assistance. There was an outpouring of volunteers. High school students helped mind and care for the children, and several doctors, nurses and pharmacists responded. I extended my leave period another day, as there was quite a demand for medical services. Luckily, the Louisiana State Heath Officer visited the shelter and saw me working. As supervisor of the public health portion of my residency training, he immediately assigned me to hurricane relief. This substituted for my scheduled rotation to another rural Parish Health Unit upstate.